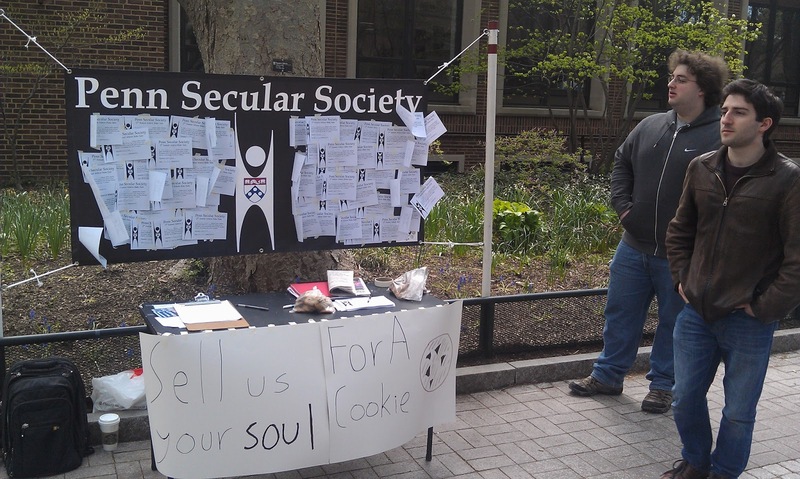 This past Monday, the students of the Penn Secular Society set out to demonstrate exactly how many people value delicious fresh baked chocolate chip cookies over their eternal souls. 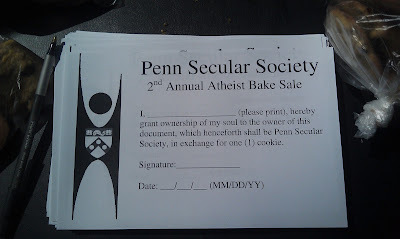 I _______ (please print), hereby grant ownership of my soul so the owner of this document, which henceforth shall be Penn Secular Society, in exchange for one (1) cookie. 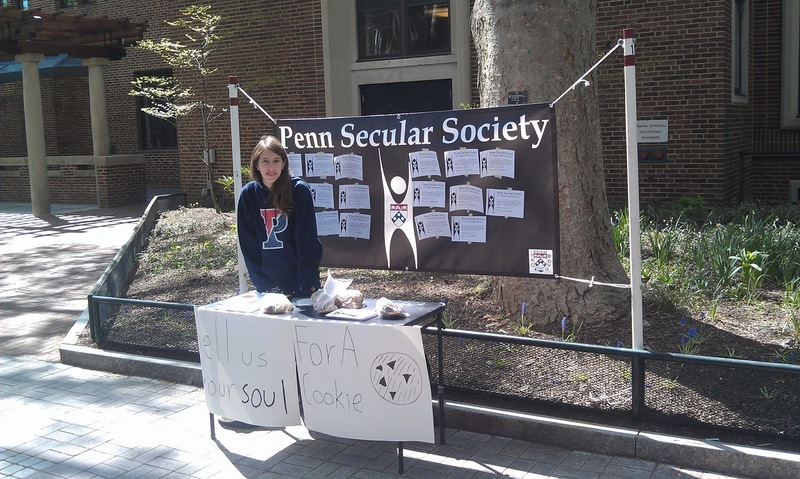 As the cookie supplies dwindled, the heathens boasted of their success by posting the collected souls on the PSS banner behind the table. As the day went on, the banner quickly ran out of room. Over the course of the day, 98 souls were collected (a 25% increase over last year's harvest). 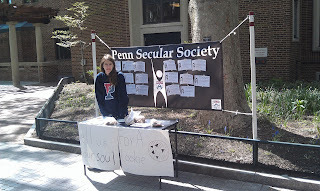 In a fortunate twist of placement, the table was set up right across the walk from the Office of the Chaplain. Two of the chaplains politely declined offers of cookies, though as one explained "I just had a cookie at my last meeting." 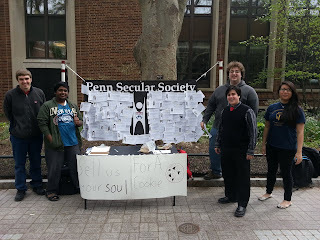 Not only was this already a successful publicity event, but it was during Penn Preview Days so large tours of incoming freshmen were walking by at regular intervals. Several stopped for cookies, and many more walked by with smiles and uncontrolled laughter. Surprisingly to me, the most common reaction was out and out laughter. 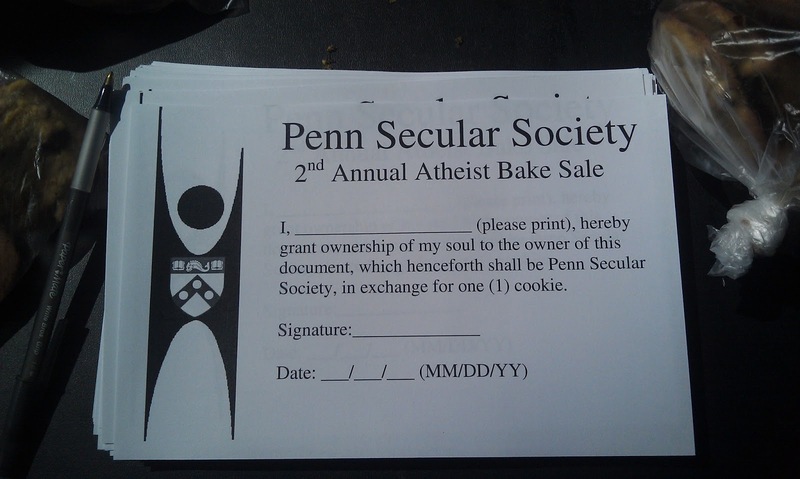 Apparently the sales pitch of "Sell your soul for a Cookie!" was not being taken seriously for some reason. Amid the laughing multitudes, however, three individuals stood out. The first was the fire and brimstone street preacher who had been ranting all morning a couple blocks away. Fortunately he seemed to be on his way to lunch as he passed us so he paid us no more than 15 seconds notice. The second was a kind young lady who was genuinely curious about what separates us from the other animals if not a soul, which was one of the most interesting and productive conversations I've had with a believer in a long time. Finally, a young gentleman decided to bring it upon himself to start a debate on the existence of God with me. After half an hour of running through variations on the First Cause argument, he seemed to question my ability to reason logically because I wasn't accepting the argument as sound. For the next chunk of the debate he tried to explain to me how probabilistic reasoning works. Having spent the vast majority of my time in grad school studying exactly that subject I felt obliged to correct many oversimplifications made of my chosen epistemology. After finally coming to some sort of understanding about proper Bayesian analysis, he started the slow and unmistakable descent into the mire of intelligent design arguments. "Finally," I thought, "something more concrete and arguable than abstract assertions of theology and philosophy." My counterpart laid out the claim that complexity is in fact the hallmark of design and seemed incredulous when I declined to agree. After explaining that simplicity is a better hallmark of good design and engineering and that all of his examples were design contrasted with the apparent lack of design in natural phenomena (coins stacked on a beach, trees planted in rows, etc) I asked him for a definition of complexity. What seemed like a few minutes of silence passed, followed by a quick exchange of contact info, a promise to continue the discussion online, and a goodbye. All in all the event was very successful, with 98 souls claimed and 2 seeds planted. Don't let them take our right to bully!